An accomplished songwriter, cabaret artist, theatre actress, comedienne and former ABC radio presenter, Nadia Sunde is a standout performer, engaging and delighting her audience as she would an old friend. 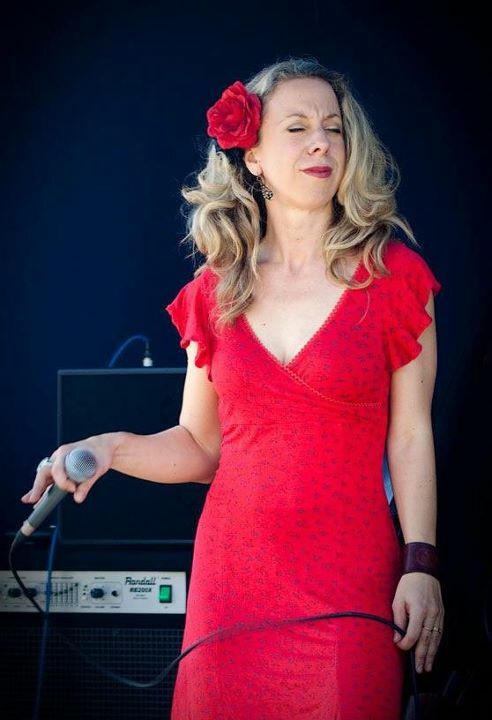 Her album 'Stoking The Fire' was 'Album of the Week' on ABC 612 following its release with a sell out show at the Brisbane Jazz Club in January 2014. It still receives national airplay on ABC Local Radio...that's 58 stations around Australia! Beginning her performing career 18 years ago, Nadia toured the Australian folk circuit as the lead vocalist and bass player with folk/roots group Spot the Dog. Recording two albums and winning vocalist awards, she soon became a festival favourite. During her time within the Australian music scene, Nadia was acclaimed for her powerful stage presence and 'divinely warm and soulful' voice. Between 2003 & 2011, Nadia became a household name in her home of South East Queensland as a presenter/producer for ABC Coast FM. Her Saturday night program 'Into the Groove' was a weekly highlight, featuring new releases, interviews and live performances from touring national and international artists. With the arrival of motherhood, Nadia joyfully began to craft songs for her own children. These songs became her multi-award winning 2010 album Homespun, recorded and produced by her long time collaborator, virtuoso guitarist Michael Fix. The songs from Homespun became the inspiration for Nadia's Wish, a live musical theatre experience for children and families which debuted at the State Library of Queensland for a three week season in January 2010. One of the songs from Homespun was also published as a children's illustrated book. In 2012 Nadia launched her new musical comedy for children and families 'Nadia & The Blue Flamingo' with sellout performances at the Melbourne Recital centre. The show was included in the 2013 Arts Queensland Touring Showcase, with a Queensland regional tour that travelled from Noosa to Longreach and a whole bunch of towns in between! In 2014 Nadia launched a new work for families called 'The Treasure of Captain Curlylocks' at Bleach* Arts Festival, Gold Coast Queensland. This show also went on to tour regional and is still in high demand. 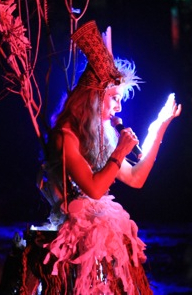 Nadia featured as a guest vocalist in the 2012/13 Woodford Folk Festival Fire Event to an audience of 20,000 and in the world premiere of Linsey Pollak's new work 'The Dream of Zedkat Nabu' (pictured below). This show went on to win the 2013 APRA Art Music Award for 'Queensland Performance of the Year'. Nadia's current projects include her concert cabaret show '1971 - The Music' which is touring in 2018 and 2019, a stunning new children's immersive theatre work called 'The Collectors', a cabaret currently in development featuring her beloved character 'Slavka' to be launched in early 2019, ongoing collaborations with dance theatre company 'Everybody NOW!' and her work as Australasian representative for the Harry Potter book series in partnership with Bloomsbury Books. She's a busy woman and wouldn't have it any other way. "Wow - the phrase 'that's entertainment might have been coined for Nadia Sunde who presented a program of song, repartee and music that totally charmed the packed house. As an accomplished singer/songwriter and cabaret performer her wry sense of humour and quick wit have added their distinct flavour to her almost poetic lyricism. There is no doubt that even more people will be clamouring for seats for any of Nadia's future performances at the BJC …. I'll be there for sure!" Alan Western, Manager, Brisbane Jazz Club.